click image for close-up While not mentioned in the title, William Russell Birch's engraving of "Goal, in Walnut Street Philadelphia" depicts an important event in the founding of Bethel, the "Mother" church of the African Methodist Episcopal denomination. 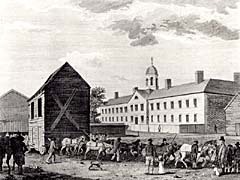 While the "goal" (a misspelling of "gaol," the archaic spelling of "jail") stands in the background and to the right, the engraving prominently displays a wooden building mounted on wheels, being drawn by six teams of horses as white spectators look on. In 1794, Richard Allen "bought an old frame that had been formerly occupied as a blacksmith shop... and hauled it on the lot in Sixth near Lombard street, that had formely (sic) been taken for the Church of England. [He] employed carpenters to repair the old frame, and fit it for a place of worship."